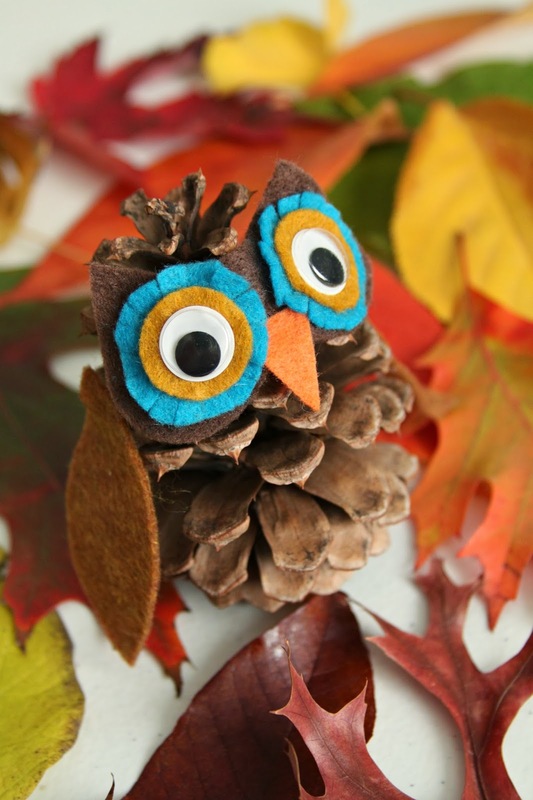 I scoured Pinterest for a pinecone owlie project to craft with some 4th grade kidlets this week. I couldn't find exactly what I was looking for. So here's my version. I think he is the cutest little pudgy thing ever. 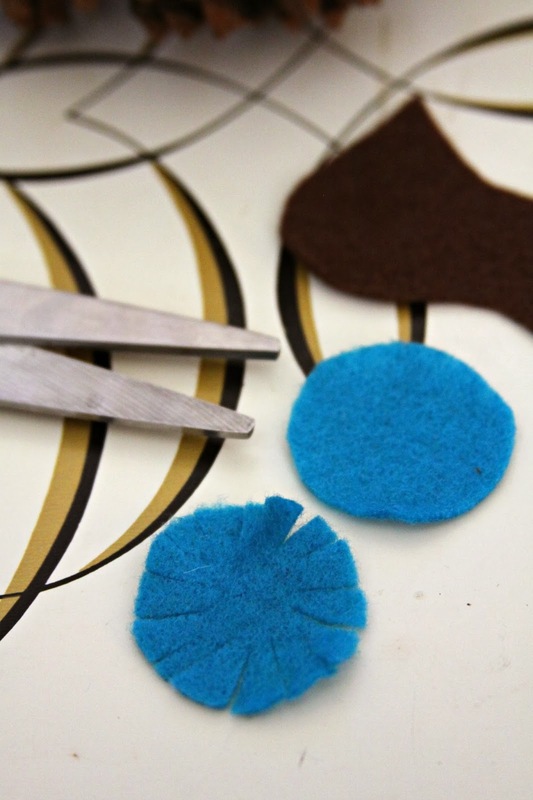 First, cut out your felt. I don't have any patterns for you to print. I need to figure out how to do that. The shapes are so forgiving, & it doesn't have to be perfect. Just get out your scissors & cut! Snip the largest eye circles all the way around, as pictured. Next, attach the beak to the face with hot glue. Now, stack the pieces in this order & use a stapler to keep it all together. (I have 25 minutes to do this craft with a handful of 9 year olds. I was trying to think of the quickest way to assemble without having to use glue.) And, honestly, my stapler did give me an attitude. So, if you're not pressed for time, use the hot glue gun! Attach the googly eyes with hot glue. 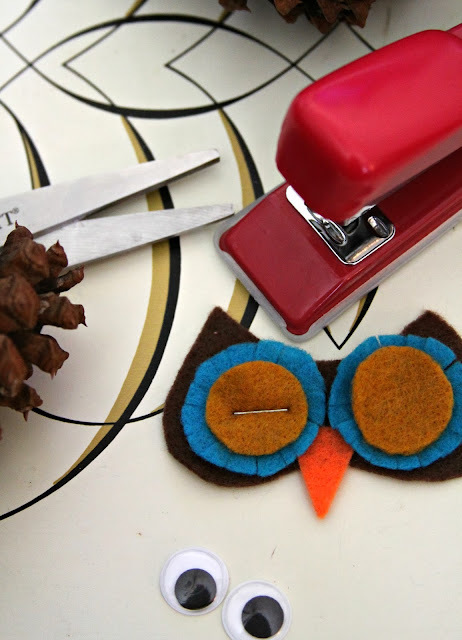 TIP: apply the hot glue to the felt first, & then place the googly eyes on top of the glue. The tip of the hot glue gun can melt the back of the googly eyes & cause a googly mess. 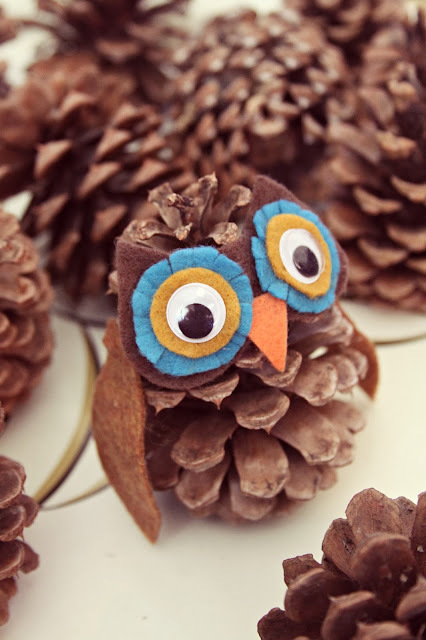 Finally, attach the face & wings to the pinecone with more hot glue. 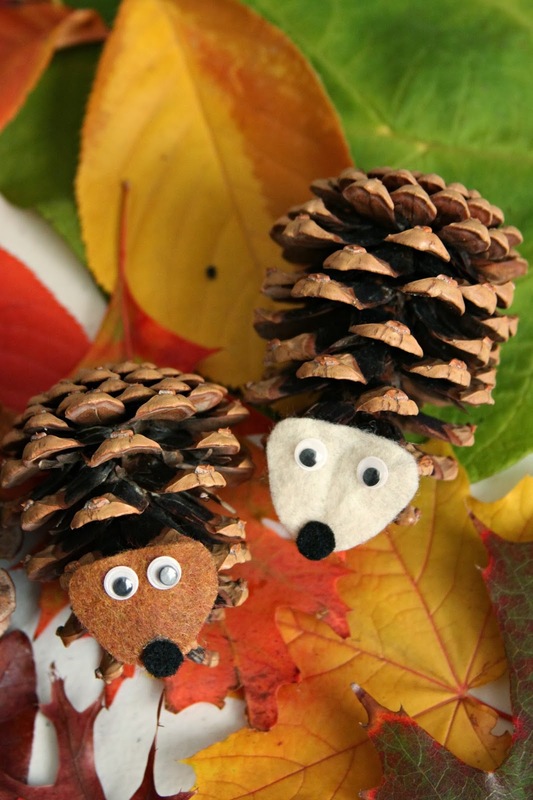 I decided the owl needed some woodland friends, so I crafted up these hedgehogs. 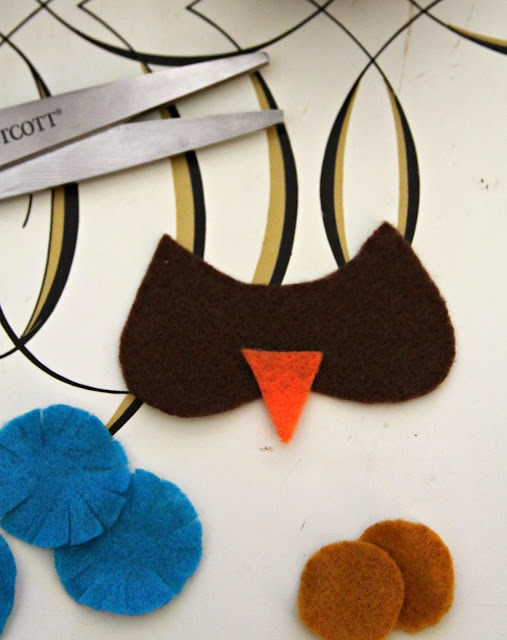 For the hedgies, you only need 2 colors of felt: a little circular black nose + the color you choose for the face, cut in the shape of a triangle with the corners rounded-ish. The googly eyes are 1/4" round. Hot glue the pieces to the face, & then glue the face to the pinecone. Note: the pinecone is laid on its side, with the "pointy" end serving as the base for the face. I love the little hedgehogs! Super duper cute!! Great idea, thank you for sharing. I will be heading up a craft in November with some friends, this will be perfect. Oh how clever, I will have to look out for pinecones now. Hah :) these are so darn cute! tfs! Just love this! 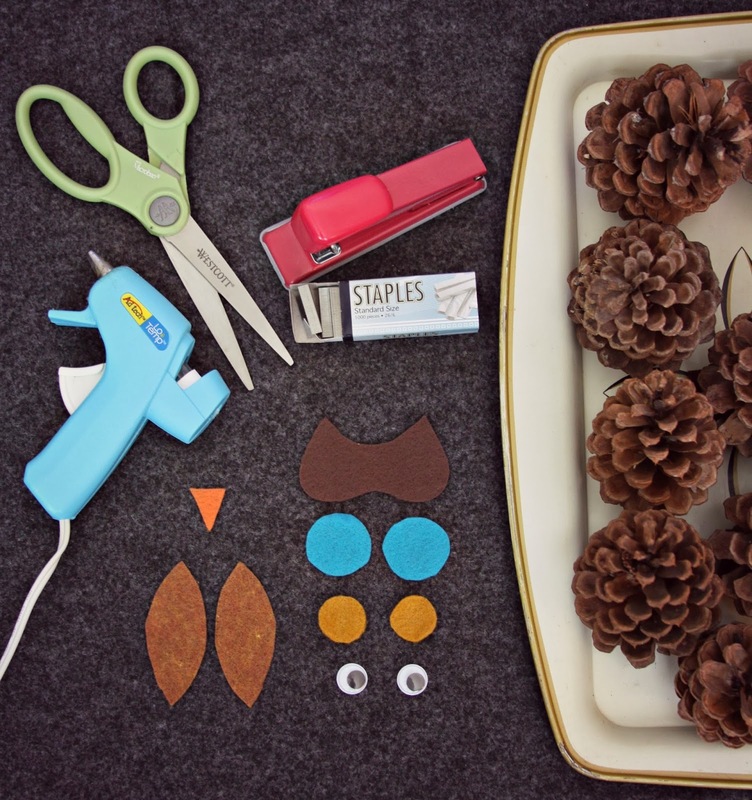 Doing a round up of pine cone crafts and am including one photo and a link back to your post, hope that is okay, and would love to see you on my creative linky party, craft schooling Sunday! lots of great inspiration and small enough that you can certainly get featured. hope to see you there! If you have other kid-friendly craft tutorials, we'd love for you to submit them. Thanks for a clever project idea! Thank you for sharing my project & link with your readers! When using a hot glue gun for the majority of the project, and having the pieces pre-cut, how much are the children really assembling? Does it still seem like a worthwhile project for kids? I always struggle with this. 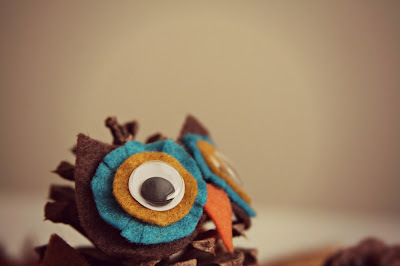 I love so many cute crafts, but I feel like if I, or another leader, are doing the majority of the process, then is it still a good craft for kids? Since you mentioned you had 25 minutes to do this craft with 9 year olds, I'd love to hear your evaluation! Thanks! Hi Jami! I precut the pieces only for this online tutorial. But all the kids in my craft club cut out their own shapes. I might have had a paper template they could trace if they wanted to. And as far as the glue gun goes, the kids LOVED using a glue gun. Before every class, I always give a quick 15-second review about safety, etc. And I always make sure I use a low-temp glue gun. For my own sanity & patience, I definitely would not have younger kids using the glue gun. But that's just me. Haha!